The International Racketlon Federation today makes official the calendar of the 2006 IRF Racketlon World Tour. A cousin of Triathlon and Decathlon, Racketlon is the sport where players challenge each other in all four of the world's major racket sports table tennis, badminton, squash and tennis. Four sets to 21. Most points is the winner. 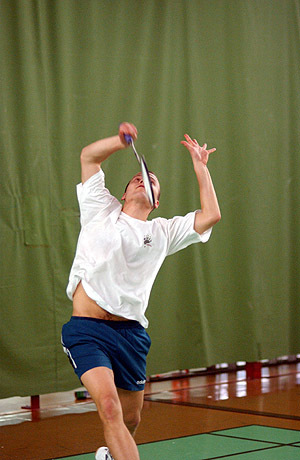 Given the fact that the first international Racketlon competition was played only in November 2001 and a spectacular growth by 200% during the last two years (from 524 players to 1590 players from 44 different countries on the world ranking - referring to the period from Jan 2004 through Dec 2005) we believe that Racketlon is, at the moment, the fastest growing sport in the world. This was further emphasized a few weeks ago at the Vienna World Championships - an event that attracted nearly 400 players from 30 countries. In 2006 the World Tour takes place for the fourth consecutive year. It contains 12 tournaments and compared to last year there are two new venues; Pécs in Hungary and Birmingham in England. Like the last two years the tour will cross the Atlantic in March with Canadian Open in Toronto and it will peak in the beginning of June at the World Championships in Belgium. The tour constitutes yet another in a series of increasingly ambitious efforts to find an answer to the question "Who is the Best Racketplayer in the World?" Is there still anyone unknown out there that could challenge this year's World Champions Mikko Kärkkäinen (Finland) and Lilian Druve (Sweden)? Although not exactly unknown these are three potential challengers on the men's side: Canadian former squash World Champion Jonathon Power is apparently also a good tennisplayer. Swedish former tennis World #1 Stefan Edberg has taken up squash and plays it at an elite national level (and did, in fact, win a racketlon tournament last year - although that was a small local one in his hometown Växjö). There are also indications that former table tennis World #1 Jan-Ove Waldner (also from Sweden) might be interested to try Racketlon when his incredibly successful table tennis career comes to an end. He is said to play a strong game of Tennis and everyone who has seen him play tends to believe that he could do almost anything with any ball. If the reader of this press release is an excellent all-round racket player the IRF Racketlon World Tour constitutes an opportunity to find out if he even, in fact, is a top international racketlon player. But the tour events are not targeted on elite players only. Anyone can take part in a tour event (most events will contain at least one separate class for amateurs) and everyone will get a position on the IRF Racketlon World Ranking. More information about Racketlon in general and the tournaments of the tour in particular can be found at www.racketlon.com, the home page of the IRF.